This article is focused on the visions of pilgrimages to Rabbi Nachman’s site located in Uman, Ukraine. Research results are based on the analysis of in-depth interviews with eighteen Americans who have made the pilgrimage, supplemented by reading in secondary sources about pilgrimage and travel, especially American Jewish travel to Eastern Europe. Emphasis is made on the perception of both place and locals, as well as upon the leading motives and characteristics of pilgrimage. This research sheds light upon the role of existing stereotypes and personal encounters in cross-cultural issues. 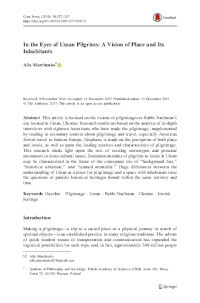 Dominant attitudes of pilgrims to locals in Uman may be characterized in the frame of the conceptual trio of “background fear,” “historical aftertaste,” and “learned neutrality.” Huge differences between the understanding of Uman as a place for pilgrimage and a space with inhabitants raise the questions of parallel historical heritages bound within the same territory and time.